The MAX3221E MAX3223E MAX3243E are 3V-powered EIA/TIA-232 and V.28/V.24 Communications Interfaces with Automatic shutdown/wakeup features, high datarate capabilities, and enhanced electrostatic discharge (ESD) protection. All transmitter outputs and receiver inputs are protected to 15kV using IEC 1000-4-2 Air- Gap Discharge, to 8kV using IEC 1000-4-2 Contact Discharge, and to 15kV using the Human Body Model. 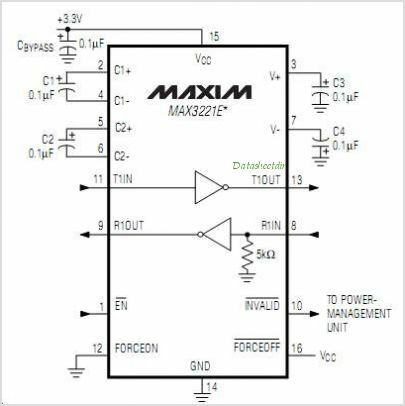 The MAX3221E MAX3223E MAX3243E achieve a 1A supply current with Maxim's revolutionary AutoShutdown feature. They save power without changes to the existing BIOS or operating system by entering low-power shutdown mode when the RS-232 cable is disconnected, or when the transmitters of the connected peripherals are off. The transceivers have a proprietary low-dropout transmitter output stage, delivering true RS-232 performance from a +3.0V to +5.5V supply with a dual Charge Pump The Charge Pump requires only four small 0.1F capacitors for operation from a +3.3V supply. Each device is guaranteed to run at data rates of 250kbps while maintaining RS-232 output levels. The MAX3221E contains just one driver and one receiver, making it the smallest single-supply RS-232 transceiver. The MAX3223E has two drivers and two receivers. The MAX3243E is a complete 3-driver/5-receiver serial port ideal for notebook or subnotebook computers. It also includes two noninverting receiver outputs that are always active, allowing external devices to be monitored without forward biasing the Protection Diodes in ci 6e5 rcuitry that may be powered down. The MAX3221E MAX3223E and MAX3243E are available in space-saving TQFN, SSOP, and TSSOP packages. This is one package pinout of MAX3221E,If you need more pinouts please download MAX3221E's pdf datasheet. 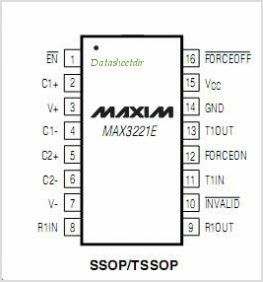 This is one application circuit of MAX3221E,If you need more circuits,please download MAX3221E's pdf datasheet.